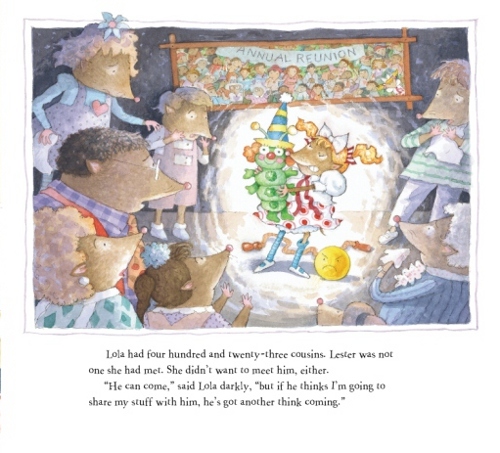 Thanks for your kind words … now please see some of my other books, and my new illustrations in Lola: A Shrew Story. Well, it’s taken me a while, but I’ve finally got some of those illustrations to show today, and that’s because the author of that picture book, Ellen Weiss—who has written over 150 children’s titles—is here this morning to talk a bit about not only that book, but another of her new titles, also released this Spring, as well as to discuss what’s next for her. 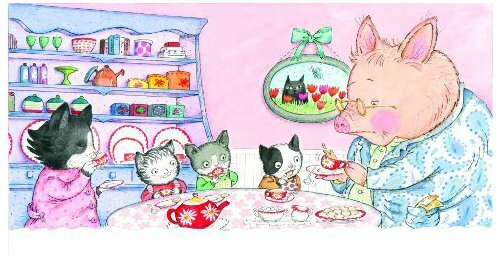 The other book Ellen’s here to discuss this morning is the wonderful new beginning-reader title Porky and Bess, written with her husband Mel Friedman, illustrated by Marsha Winborn, and released by Random House in February. Divided into short chapters, it tells the story of two very different friends. 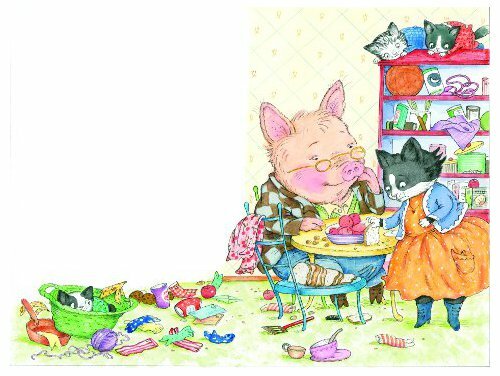 (Porky is messy, and Bess is just about perfect.) I mentioned this book back in March at this post, calling it “perfectly charming,” which it still is. Ellen: I’m very excited to have these two new books out at the same time, because they’re both books that mean a lot to me. Each of them, in its own way, is the product of years of gestation. 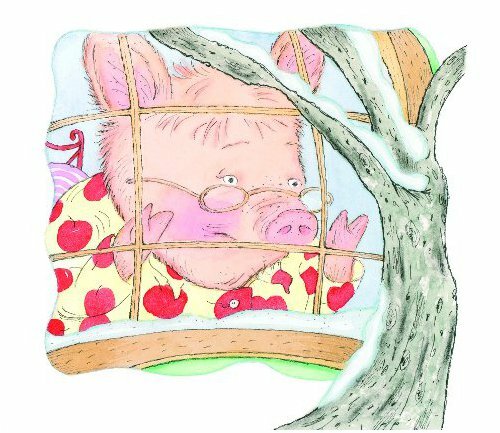 In the case of The Taming of Lola, the book was written quite a long time ago, but poor little Lola had been in a sort of cryogenic state at Abrams for years, because they couldn’t find the right illustrator. Then I happened to meet Jerry Smath socially, and when he told me he had a book that had just come out from Abrams, I told him Lola’s tragic tale. He said, “Send it to me, and I’ll see what I think.” About a week later, he called me up and said that he’d loved it and had done sketches for the whole book, and did I want to see them. (Nah…) I totally adored them, as any sane person would. He really ran amok with the details — tons of funny business, like the Chicago Grubs shirt, the argument that goes around and around the page, the grub doll with the head that comes off, and bugs, bugs everywhere. Abrams loved what he’d done too, and here’s bad little Lola at last, very much alive and kicking hard. Porky and Bess followed a more normal path. What took a long time with that book was figuring out what it should be. The title had come to me years ago, but nothing else. My husband and I kicked around a lot of ideas, but nothing was working right. 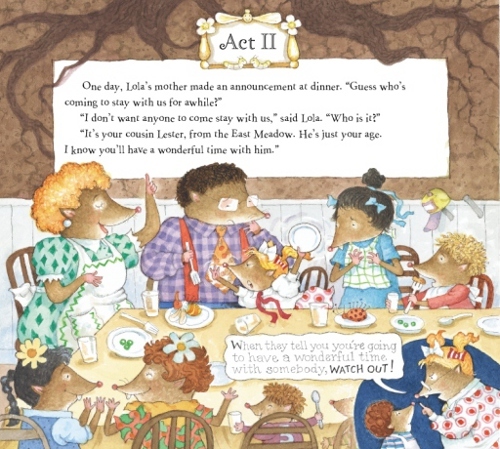 Then I woke up one morning and it was crystal clear: It should be an early reader in the Frog and Toad vein. (Duh. Seems so obvious now.) Random House had Marsha Winborn do the art, and as the editor kept sending me PDFs of sketches and finished art, I got more and more excited. I think she did an incredible job. I love the palette she used. And she, too, went to town on the details. I especially love the cloven-hoof-shaped socks that litter Porky’s floor. I hadn’t been familiar with Marsha’s work before, but now I’m a BIG fan. What I’m working on right now is all over the map. Which is a good thing. A couple of board books with Simon and Schuster, a proposal for a YA book I’m working on with my husband (YA is the one age level we’ve never done, so it’s a really interesting challenge), and maybe a couple of early readers. I’m feeling more energized right now than I have in a long time . It’s all a big mystery to me, the creativity thing. 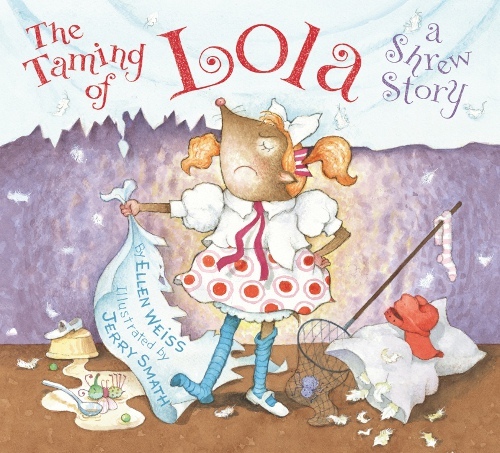 THE TAMING OF LOLA: A SHREW STORY. Copyright © 2010 by Ellen Weiss. Illustration copyright © 2010 by Jerry Smath. Published by Abrams, New York, NY. PORKY AND BESS. Copyright © 2010 by Ellen Weiss and Mel Friedman. Illustration copyright © 2010 by Marsha Winborn. Published by Random House, New York, NY. How about a Jerry Smath interview? 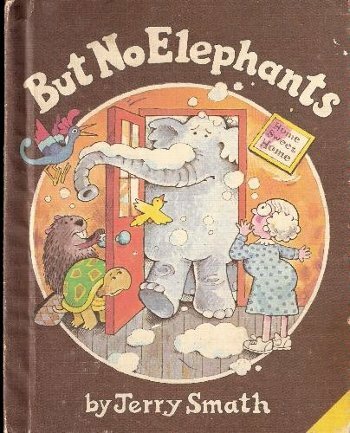 But No Elephants was a favorite of mine as a child and probably lots of others in their late 20s as it seemed that every doctor’s and dentist’s waiting room in the 80s had a copy. Now I read it probably 10 times over the course of each school year. The book is so popular in my 2nd grade classroom it never makes it onto the shelves. It’s also my go to example when I model oral retelling. Simple, and memorable story with wonderfully endearing illustrations. 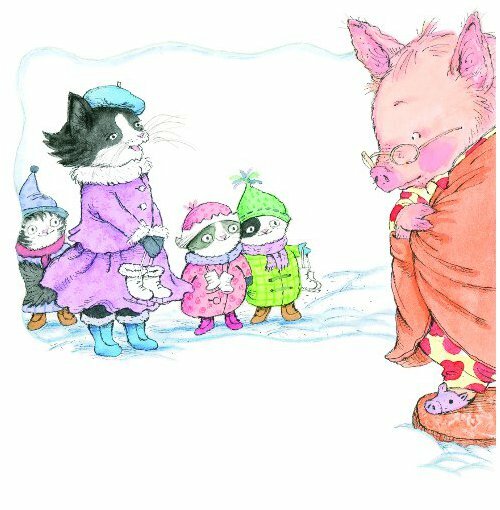 Growing up in central new york, I thought Grandma Tildy’s hatred of winter was perfectly normal. Didn’t realize Smath was still illustrating. I’m excited to look at some of his newer stuff! Squeeing over all these spreads! Thanks for featuring these, Jules. Nice to hear Ellen’s comments. Will definitely check out both books. Can’t resist kitchen/table scenes :). But No Elephants! Now THAT’S a blast from the past. Apparently this book was published the year I was born. I can’t say it was one of my favourites when I was a kid, but I definitely do remember it. It bothered me that the elephant had to be excluded, but it also bothered me that he ended up wrecking everything. Talk about five-year-old angst. But No Elephants!!!! You just took me back about 15 years with that book cover. It was one of the only children’s books at my grandparent’s house, and I must’ve read it a thousand times. Thanks for the flashback! Yup, a blast from the past for me too…and the present, as I picked up a copy a few years ago to read to my kids. Ahh, the nostalgia. Ellen Weiss is one of my favorite children’s authors of all time! She rocks!